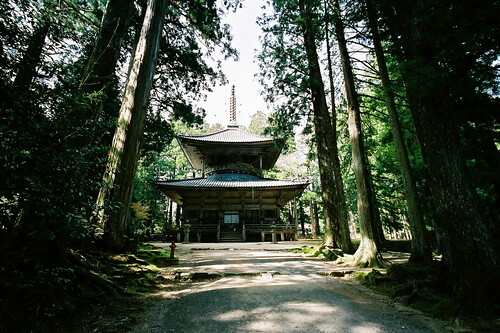 The Garan area is the central temple complex of Koya-san, and is home to the Kondo, the hall where Kukai gave his sermons. The Kondo was originally built in 819, though it’s been repeatedly destroyed and rebuilt since then. 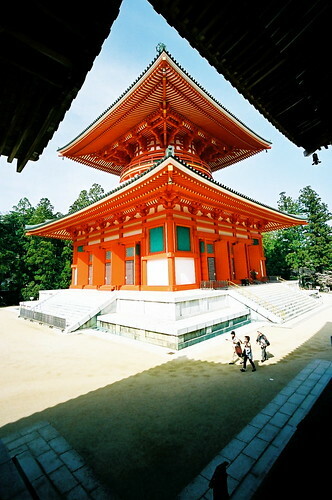 The Garan area is also the site of the Konpon Daito, a lacquered persimmon-colored pagoda that sits at the center of the eight-mountain lotus mandala that forms the area around Koya-san. The Konpon Daito is extraordinary, and probably Koya-san’s most famous building, at least among those who aren’t practicing Shingon Buddhists. 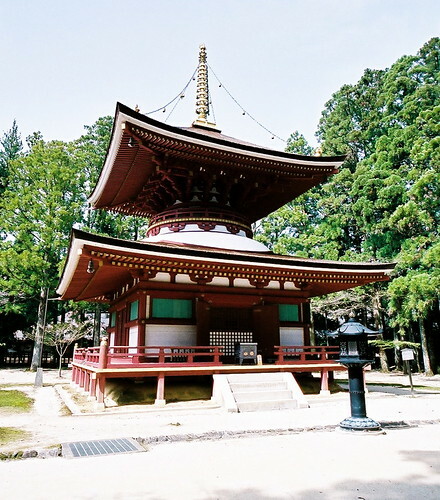 The Garan is also the home of two smaller pagodas, the Saito and the Toto, as well as several buildings that are of central importance in the Shingon system of belief. Because of Kukai’s historical presence and entombment at Koya-san, Koya-san is the starting point, and point of return, of the famous 88-temple pilgrimage around the perimeter of Shikoku. Throughout the day Jess and I would routinely see groups of pilgrims, dressed entirely in white, walking the mountain roads. 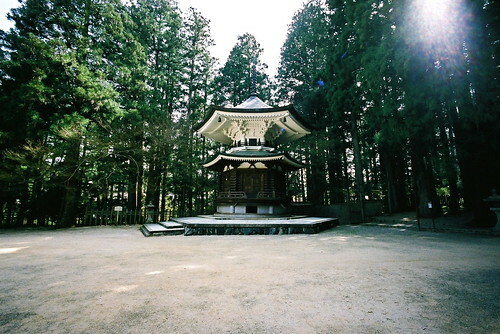 This is the Toto, a smaller pagoda that was destroyed in a fire in 1843 and rebuilt in 1984. 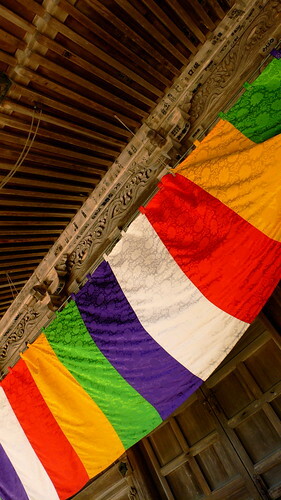 I’m not sure what the significance of the Daiedo is, but the beautiful, multi-colored banners that were hanging across the entry were gorgeous. In the light breezes they would billow, allowing forms to play across their surface. This is the famous Konpon Daito pagoda. The persimon-colored stupa simply glows in the middle of the complex, a richly lacquered monument to the golden Dainichi Nyorai cosmic Buddha that sits at its center. Inside the stupa the blue-haired Dainichi Nyorai is surrounded by four smaller golden Buddha statues and a forest of orange pillars, each one showing the painted figure of a bodhisattva sitting inside a lotus blossom. The bright colors used inside the pagoda are almost psychedelic in their intensity and strongly recall Chinese, and perhaps even Indian, influences. Around the perimeter of the dais on which the statue of the cosmic Buddha rests, hundreds of coins, delicately balanced on their edges form a universe of silent, round offerings. Each one is totally still, and yet the totality contains the potential for immense movement. The Miedo, or Hall of Eternal Rest, is supposed to have been Kukai’s residence. 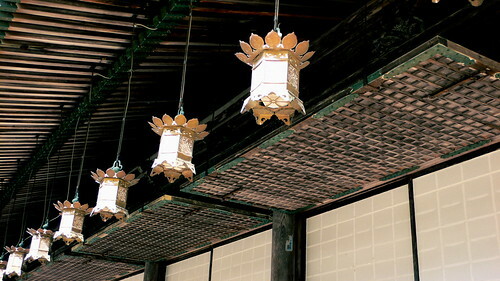 This hall is surrounded by hanging lanterns, and a portrait of Kukai is enshrined within. A closer view of the hanging lanterns at the Miedo. 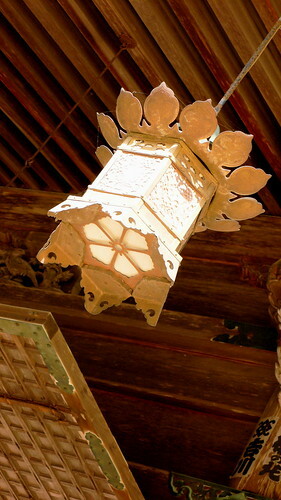 These lanterns are similar to the ones at the famous Torodo, or Lantern Temple, located at Okunoin. 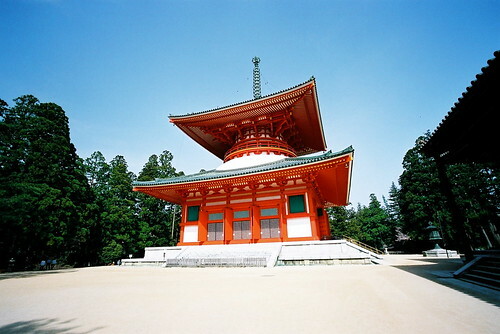 The Saito is the third major pagoda located in the Garan complex. This pagoda is made from wood and is more subdued than the Konpon Daito, which makes it easier to notice the complex arrangements of the wooden members that compose the pagoda’s body. These remind me of an elaborate wooden puzzle, or some kind of strange variation of the Rubik’s Cube. 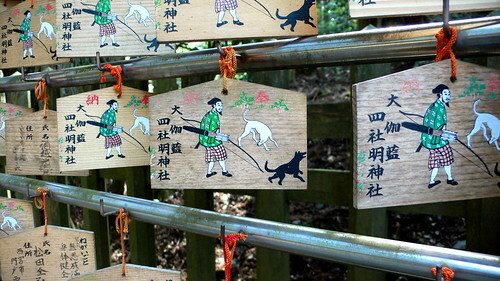 The Garan complex also houses the Myo Shrine. 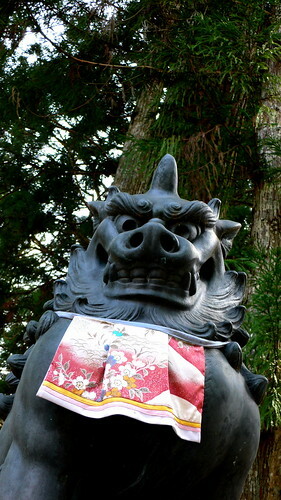 This is one of the guardian Shishi that can be found outside the entrance torii. One of the placards to be found outside of the Myo Shrine, which was closed on the day that Jess and I visited. This is a repository for sutras, built at the instruction of Bifukumon-in, the wife of Emperor Toba, in memory of the late Emperor. Bifukumon-in herself is said to have written the 3,568 sutras (on blue paper with gold ink!) that are housed in the storehouse.